Last week, the federal government released detailed data on 2018 open enrollment in private health insurance through the healthcare.gov Marketplace created by the Affordable Care Act (ACA). We dug into the data to see how enrollment shaped up in Tennessee’s Marketplace and to compare 2018 to prior years. For a review of county-level data, see this follow-up post. Enrollment in Tennessee’s Marketplace fell 2% in 2018 and appears to be leveling out — although federal policy changes may drive future enrollment lower. 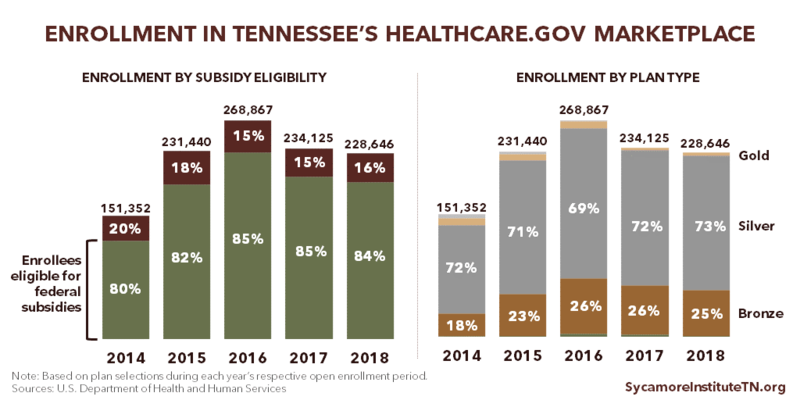 Average net monthly premiums fell about 50% in 2018 for subsidized enrollees in Tennessee but rose about 32% for enrollees without subsidies. The lowest-premium plans have become increasingly popular as premiums have risen, which has shifted more responsibility for out-of-pocket costs onto enrollees. This trend is even sharper among the 16% of enrollees without subsidies. 1. Enrollment in Tennessee’s ACA Marketplace was relatively stable with only a 2% drop from 2017. 2. 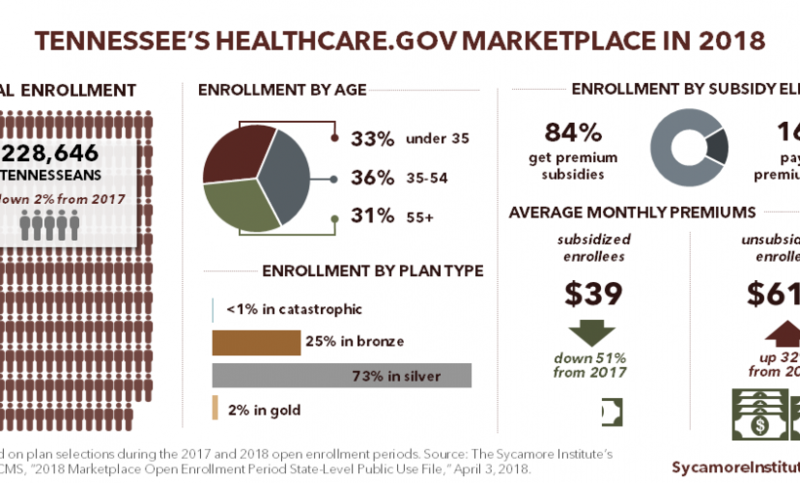 Average net monthly premiums fell about 50% in 2018 for subsidized enrollees but rose about 32% for enrollees without subsidies. When the Trump administration stopped making cost-sharing reduction (CSR) payments to insurers in 2017, many predicted that premiums would rapidly increase in 2018. In fact, premiums did rise sharply for plans tied to the CSR program. These higher premiums triggered larger federal subsidies, which allowed many subsidized enrollees to pay less in 2018 than in 2017. Nearly all sign-ups were for bronze or silver plans. 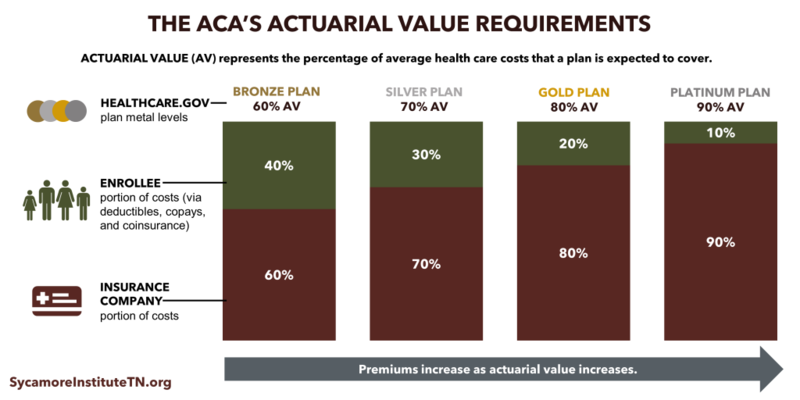 Plans’ “metal levels” indicate their actuarial values — the share of average health care costs that plans are expected to cover. (Figure 2) Compared to gold and platinum plans, bronze and silver plans cover fewer out-of-pocket costs and tend to have lower premiums. (Figure 1) The proportion of Tennessee enrollees under 35 has remained relatively stable since 2014. (4) (5) (6) (1) This is one indicator of the breadth and stability of Marketplace insurers’ risk pools — an important factor in how premiums change. Enrollees’ health status, insurer and enrollee incentives, and the stability of the regulatory environment also affect premiums. Looking at the broader context for Tennessee’s ACA Marketplace since it launched in 2014, we see 3 trends affecting enrollment and premiums. 1. Enrollment appears to be leveling off, although recent federal policy changes may drive it lower. After peaking in 2016 at about 269,000 people, sign-ups in Tennessee fell in 2017 to 234,000 and were relatively stable into 2018 with a small drop to about 229,000. (Figure 3) (4) (7) (6) (1) (2) After open enrollment closed, however, Congress repealed the penalty on individuals who do not sign up for health insurance coverage. In addition, the Trump administration has issued rules intended to increase the availability of plans that cost less but have fewer benefits than those available in the Marketplace. As a result, some Tennesseans who might otherwise enroll in the Marketplace may instead choose to go uninsured or get their coverage outside the Marketplace. 2. Federal subsidies have insulated most enrollees from the lion’s share of premium increases. 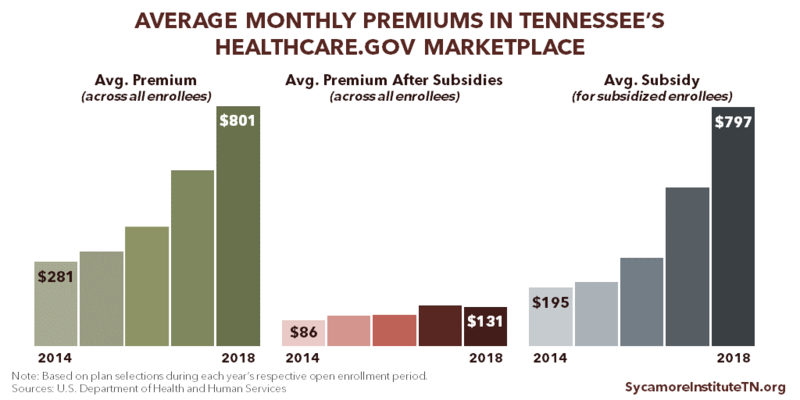 The average monthly premium (before subsidies) for all Tennessee Marketplace enrollees has grown from $281 in 2014 to $801 in 2018, a 185% increase. (Figure 4) After accounting for subsidies, the average out-of-pocket premium across all enrollees grew about 52%, from $86 in 2014 to $131 in 2018. (8) (7) (9) (1) (2) Due to the dramatic difference in premiums paid by subsidized and unsubsidized enrollees, these averages do not necessarily reflect the typical enrollee’s experience. However, data that allow for comparisons between subsidized and unsubsidized enrollees are only available for 2017 and 2018 (see point 2 in the previous section). Average subsidies have increased faster than average premiums — by 309% between 2014 and 2018. (8) (7) (9) (1) (2) Federal premium subsidies limit the cost of premiums based on income and are available to Marketplace enrollees with household incomes between 100-400% of poverty. For example, in 2018, Marketplace premiums are capped at 2.01% of household income for individuals with incomes between 100-133% of poverty. (10) This structure ties the value of subsidies to the cost of premiums. 3. The lowest-premium plans have become increasingly popular as premiums have risen, which has shifted more responsibility for out-of-pocket costs onto enrollees. In 2014, 9% of all sign-ups in Tennessee were in gold and platinum plans, which charge higher premiums in exchange for lower out-of-pocket costs. In 2018, the share of gold and platinum plans fell to 2%. 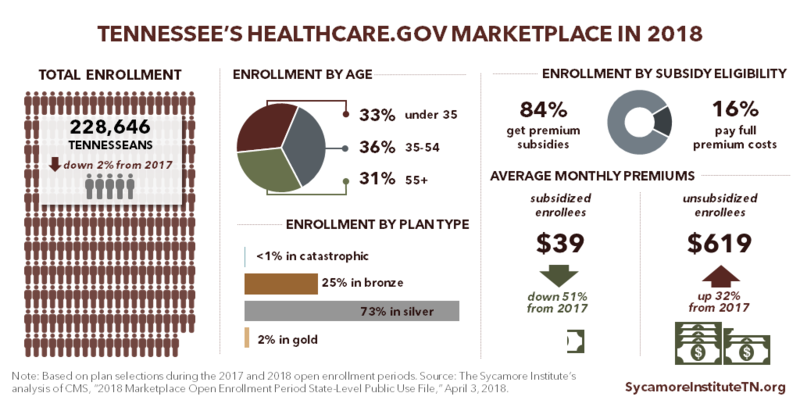 Meanwhile, Tennesseans’ selection of bronze plans grew from 18% of all sign-ups in 2014 to 25% in 2018. (4) (5) (6) (2) (Figure 3) This shift has made the rise in average premium less severe but also puts enrollees on the hook for higher average copays, deductibles, and other out-of-pocket costs. Marketplace insurers must submit their proposed 2019 premiums by July 25, 2018. Plans and rates will be finalized by late September ahead of the 2019 open enrollment period, which runs from November 1 to December 15, 2018. (11) Changes to the regulatory environment between now and then could affect 2019 Marketplace offerings, premiums, and enrollment. Congress does not currently appear poised to further change the rules for individual market coverage this year. Last year, Congress shelved several proposals to partially repeal and replace the ACA (e.g. the American Health Care Act and the Graham-Cassidy proposal). Efforts this year to tweak the existing structure (e.g. Senator Alexander’s proposal to fund CSR payments and a reinsurance program) have so far not been successful. In December 2017, Congress repealed the penalty for the individual mandate as part of tax reform legislation. In January 2018, the Trump administration proposed new rules that may increase the availability of non-ACA compliant plans with lower-costs and smaller-benefits than plans in the Marketplace. These rules are expected to be finalized in the coming months. There are trade-offs to these changes, which provide individuals more alternatives to the Marketplace. Young and healthy people who would otherwise get coverage via the Marketplace may choose to go uninsured or opt for lower-cost, smaller-benefit plans that don’t meet ACA requirements. As a result, premiums would likely rise even higher for those remaining in the Marketplace, who would tend to be older and less healthy. Exactly how these trade-offs might be felt across Tennessee will depend on a number of factors — including demographics and health status. Kaiser Family Foundation. Explaining Health Care Reform: Questions About Health Insurance Subsidies. [Online] November 8, 2017. https://www.kff.org/health-reform/issue-brief/explaining-health-care-reform-questions-about-health/. Centers for Medicare and Medicaid Services. Key Dates for Calendar Year 2018: QHP Certification in the Federally-facilitated Exchanges; Rate Review and Risk Adjustment. U.S. Department of Health and Human Services. [Online] April 9, 2018. https://www.cms.gov/CCIIO/Resources/Regulations-and-Guidance/Downloads/Key-Dates-Table-for-CY2018.pdf. Keith, Katie. Unpacking The Final 2019 Payment Notice (Part 1). Health Affairs. [Online] April 10, 2018. https://www.healthaffairs.org/do/10.1377/hblog20180410.631773/full/.